COMPANY PROFILE Mitsubishi UFJ Financial Group Inc is a provider of financial services. It offers commercial banking, trust banking, securities, credit cards, consumer finance, asset management, leasing and many more fields of financial services. Mitsubishi UFJ Financial Group was formed by the merger of Mitsubishi Tokyo Financial Group and UFJ Holdings in 2005. With headquarters in Tokyo, the group operates across more than 40 countries and ranks as a top-10 bank globally in asset size. The group operates commercial banking under Bank of Tokyo Mitsubishi UFJ (68% total assets); trust banking under Mitsubishi UFJ Trust and Banking (13%); securities under Mitsubishi UFJ Securities Holdings (11%); and credit cards, consumer finance, and asset management through various subsidiaries. At the price of JPY687.60 as at 26 Jul 2018, Mitsubishi Ufj Financial Group Inc is trading at a Price to Book Ratio of 0.6 times current book value. 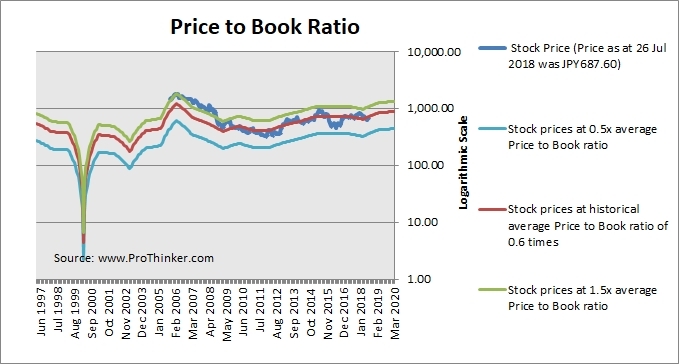 This is a 1% discount to its historical average Price to Book Ratio of 0.6 times. 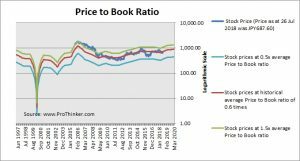 Is the stock fairly valued? One should not just look at one indicator to determine the fair value of a stock.